One Hot Stove: Announcing the Monthly Blog Patrol for July 08: Less is More! 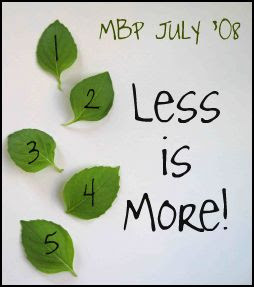 Announcing the Monthly Blog Patrol for July 08: Less is More! Many months ago, Coffee started a popular food blog event called the Monthly Blog Patrol (MBP). The event revolves around browsing through our favorite blogs and choosing recipes to cook in our own kitchens. I am thrilled to be taking over the baton from Sia (you still have a few days to get your Street Food entries to her) and guest hosting MBP for the month of July right here on One Hot Stove. The theme for July is Less is More! This means that you have to browse through your favorite blogs and your bookmarked recipes and choose those that have FIVE ingredients or FEWER to make for this event. 1. The recipe (which should be from another blog) should have five or fewer ingredients. 2. In addition to your other ingredients, you are free to use the following three ingredients because they are so widely used in cooking. Salt, water (or stock) and fats (such as oil or butter or oil spray) will not be counted in the 5-or-less list, for the sake of this challenge. 3. If you want to count the basic "tempering" (tadka/phodni/popu) or seasoning used in Indian dishes (mustard seeds, cumin seeds, etc.) as one ingredient rather than list each component of the tempering separately, that is fine by me. Once I decided on this theme, I began to see few-ingredient recipes everywhere! Look through your favorite blogs, and you will be sure to come upon some gems. If you get stumped, write to me and I'll be happy to help you out with some ideas. 1. Based on the theme of Less is More, you have to cook something from the posted recipe of a fellow blogger. This is the very premise of this event, to cook from the blogs, so the recipe has to be from another blog and not from some other cooking website or other source. 2. Post a pic of the final recipe on your blog linking it to the blogger (whose recipe you made), to this event announcement and to Coffee. Whether to make it a separate post or not is entirely your choice. You can just put a final pic or put step by step pics or if you have made any variations you might want to highlight that or post the whole recipe. It is entirely upto you. But one final pic and links to the blogger and this event is a must. to my Email address (listed below my profile on the right sidebar). I will not need your pictures for this round-up. Please use MBP July 2008 as your subject line. 4. The deadline is 25 July 2008. I like posting round-ups promptly so no late entries will be accepted. But wait- there's more! We have two giveaways for this event, just to make things even more fun. 1. I will pick two names randomly from the list of participants in MBP: Less is More and send you a couple of hand-knitted goodies. I can ship them anywhere in the world. 2. Anjali Damerla of Supreme Spice is kindly giving away one spice extract (Ginger/Cardamom/Tea Masala) to each of three randomly chosen participants. Shipping of this prize will be restricted to the US. I hope you enjoy this slightly off-beat theme for MBP. As for me, the whole month of July will feature only recipes with five or fewer ingredients here on One Hot Stove. Stay tuned! Quite smart, Nupur. We all could use easy recipes. I really enjoy reading your posts, whether or not there are recipes. Your simple and natural writing style makes it so engrossing and adds a warm personal touch to your blog. Beautiful idea! I'm going to take the plunge and enter in this one...thanks! You've come up with an unusual theme. I just love the logo. fabulous theme....lovely of you to offer your hand knitted goodies as an incentive!! as if we needed an incentive for simple cooking!! oooooooooooooooh!!! I am sooooo in!!!! quick question. what about using the leftovers? will that be considered as just one ingredient? This should be fun! and a nice break from all the elaborate cooking we ususally tend to do. what a great idea - i have several - am definitely in! I do agree it is good to makefood with less indgrdients too. Now just have to go and hunt for a recipe. When you mentioned that cookbook you came across which used 5 or less spices in Indian cooking, I really got curious and started noticing recipes better. I usually go for simple, flavourful recipes in my blog - definitely going to join in as I can always use more recipes! I just saw the weather report...i hope you are fine.Take care. Eek. I always go for "layers" of flavors -- I'll need to find something easy but tasty and maybe make an effort to post something like that on my blog to get in the mood and maybe inspire others. great blog! 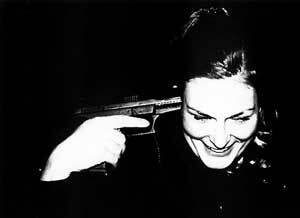 i really enjoy your posts. Love your blog.Use your panipuri pani recipe all the time.The taste is perfect for us. Hope you guys are not affected by the flooding in St.Louis. Stay safe.Will keep you in my thoughts and prayers. Nice theme. Count me in. Saw the weather forecast...hope you guys are fine. Thanks, everyone, for the enthusiastic response! I look forward to your entries. Neetu, Thank you for your concern! The floods have affected many areas around us, but St. Louis city has been spared. FJK, Thank you for spreading the word! When I started exploring few-ingredient recipes, I was surprised to find that a lot of flavor can be coaxed out of just 1 or 2 ingredients. Celie, I completely agree with you- summer is the time when I really want to avoiding "messing" with fresh produce and really enjoy its own taste. Marietta, Thank you for your concern! Many places around here have been devastated by floods- people have lost homes and farms- but we are not affected. It is sad to see people's lives being ruined by these floods. I'm glad to know that the pani puri recipe works for you- thank you for the feedback! TBC, Yes, we are fine- thank you for asking! People North of us are the ones who are facing really tough times with the floods. EmJayDee, If you can't take a picture, don't worry about it, please! You can participate anyway...don't feel like you can't participate because you don't have a picture. This is going to be a fun event:) I will look for one with the least no. This is a great idea for an event. I'm very busy just now, but I will try to participate. Thats a great choice for this event Nupur!! Just sent in mine:) Hope you received it. Nupur I posted my entry today and have also sent you a mail. Hope you got it. Can this be a new recipe that I will be posting on my blog? There seems to be a mention of using recipe from other blogs, hence this question. Sounds a great idea, do let me know. Can I submit by tom night(PST)? Will you accept it? bonziegal, Yes, if you send me the entry by Friday July 25th night (midnight) PST, I can include it.